Gary Lee Partners has developed a new office in Chicago for global ad agency Havas Worldwide. The Paris-based Havas Worldwide–the largest ad agency in Europe–wanted to reduce the square footage in their Chicago location and tasked Gary Lee Partners with finding a solution. After assessing their real estate options at various buildings, GLP recommended staying in their current building, relinquishing a floor, and redesigning their floor plan. By removing all private offices from the perimeter and installing glass in all conference rooms, GLP opened up the Havas space and provided it with much-needed natural light. The open floor plan concept became ideal for collaboration across departments and impromptu meetings. GLP implemented a common “town hall” space for large, all-office gatherings. Innovative seating options, such as bleachers incorporated into partitions, were installed for extra seating for large gatherings. In order to fulfill the client’s desire that every surface have functionality, GLP installed magnetic glass, backpainted glass and tackable materials throughout the office, from walls to columns. 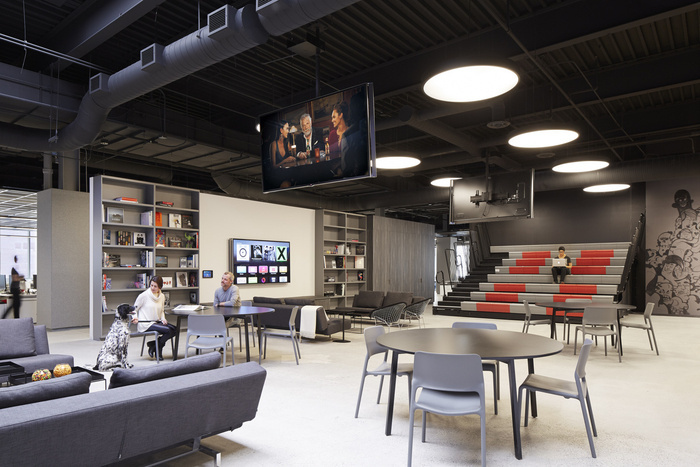 By combining design best practices with the Havas culture of innovation, GLP delivered a space that is true to the firm’s brand and employees. Every element, from the color palette to the implementation of technology, was planned with the client’s goals as a target. The resulting space is an energetic, innovative space where ideas can quickly grow and travel.